Arriving at Hadlow Stud to meet Jam Alley, it was the first day where the rain had come at last in Mooi River, and fortunately it held out long enough for our meeting and some photos with the big chestnut stallion. 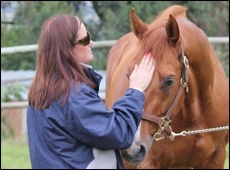 He had been standing inside his stable getting groomed and Cathy Martin, co-owner of Hadlow Stud, warned us he would come out at this time of year expecting to cover a mare, but that we shouldn’t be too concerned as he had a lovely temperament, and that he did. 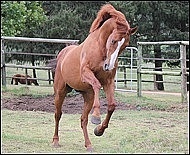 He is perfectly conformed with a beautiful head on him, and a white blaze running down his face. After about 20 minutes of realising quite patiently, it wasn’t going to be his day, he put his head down and began to graze. After standing like a gentleman to have his photos taken, his groom let him go to enjoy the rest of his day peacefully. 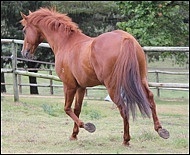 With the cool weather under his tail, he gave us an impressive display of the equine athlete that he is. He is a magnificent specimen standing at 16.1 hands and bears a strong resemblance to his sire currently standing at the well-respected Coolmore Stud in Ireland, Peintre Celebre. 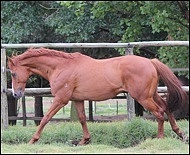 Jam Alley is the only son of Peintre Celebre currently standing in South Africa. Like all successful racehorses he carries a gentlemanly air of superiority, which in Jam Alley’s case, with his looks and pedigree, is perfectly justified. Imported from Australia and owned and trained by St John Gray, he had 5 wins over a distance of 1400 – 1800m from the age of 3 – 5, with 8 places and earning himself R1 028,325 in stakes. 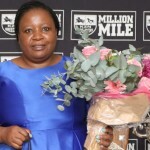 In his first four starts he won three times, including the Grade 1 South African Classic over 1800m and placing in the Gauteng Guineas over 1600m. 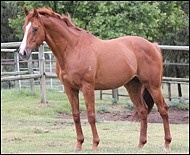 He also ran a place in the Grade 1 Summer Cup over 2000m. His sire, Peintre Celebre (Nureyev – Peinture Bleue by Alydar) was European Champion Three Year Old, and won 5 of his 7 starts, including the fastest time in Group 1 Prix de l’Arc de Triomphe. His other wins included Grade 1 Gran Prix de Paris and Prix du Jockey Club, and he was given an impressive Timeform Rating of 137. He currently stands for a fee of 12,500 Euros. 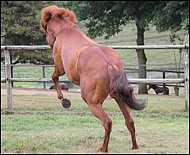 Jam Alley’s dam, Lyphard Street (Lyphard – Hotel Street by Alleged), placed in the UK and produced 5 foals and 4 winners. 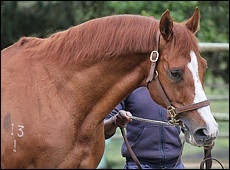 Her first was a son of Barathea called Bourbon Alley who was a 7-time winner. Her 2003 colt by Xaar called Naples, was a 5-time winner and this included the Listed Riverside Handicap and he placed in Dubai. Jam Alley’s dam-line is filled with many champions including a number of sires such as Perfect Parade (by Alleged), Regal And Royal (by Vaguely Noble), Dowsing (by Riverman), 3-time Grade 1 winner Stravinsky (by Nureyev) and Verglas (by Highest Honor). 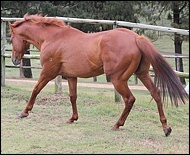 To date, Jam Alley has had 11 runners with 2 winners (Abbey Creek and Star Dance) and 7 placings from his first crop to race, bearing in mind many of these horses are still young in their racing careers. After looking at his current crop of foals born this year, it is clear he stamps his progeny. 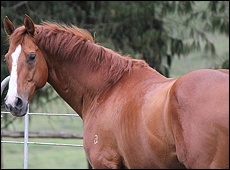 Cathy describes his foals as “very correct, quality horses that seem to display his amazing temperament”. 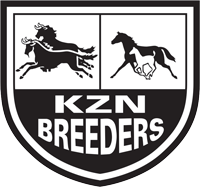 An exciting colt that was born on the evening of the KZN Breeders Awards – quite aptly as his half-sister Dancewiththedevil was announced Horse Of The Year half an hour later after his birth – is by Jam Alley out of Emperor’s Dance. 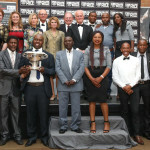 Jam Alley currently stands for a fee of R18 000 this season. 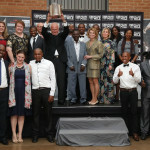 Cathy or Jonathan Martin can be contacted on 033 2631504 or Cell 082 331 5697 or alternatively email cathym@futurenet.co.za.